raw vegan lasagna at cru is no more! 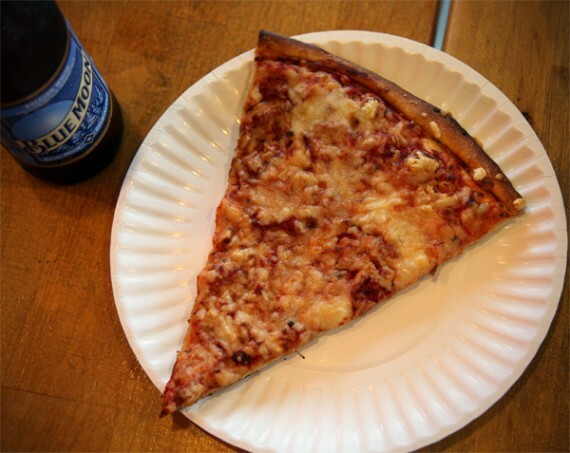 i can’t get enough of hard times pizza! 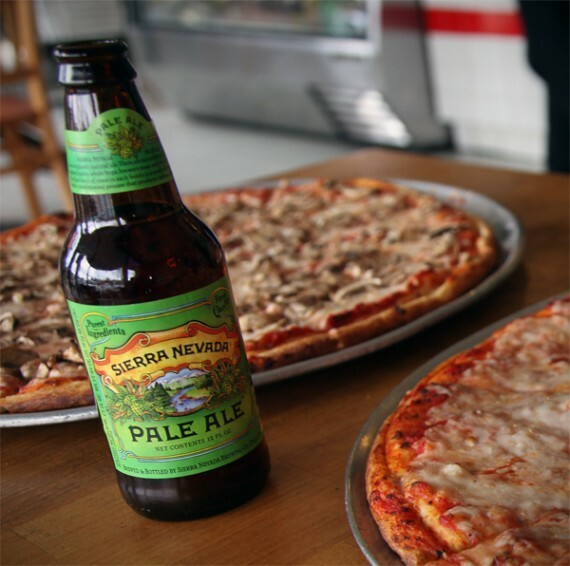 as vegan pizza day rapidly approaches, it’s important that i blog about as much vegan pizza as possible. 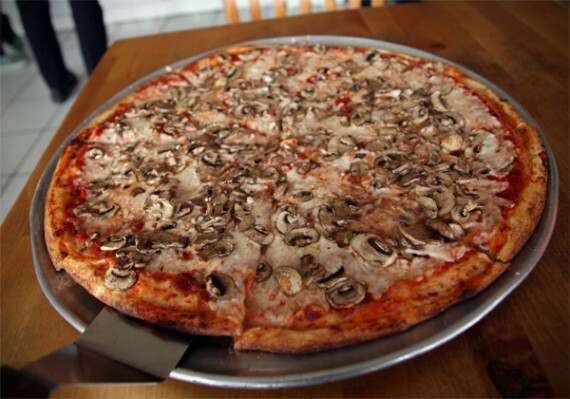 i have raved about the vegan ny-style pizza by the slice from hard times in silverlake before, and after sharing some pies with a group of friends, i’m an even bigger fan. 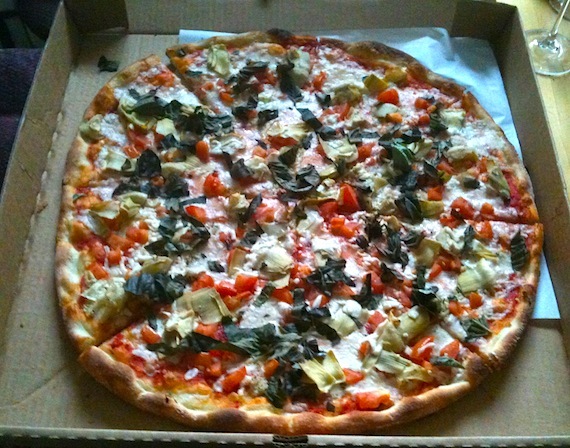 not only did the pizza taste terrific, but it was enormous and moderately priced. yes, hard times has beer as well! Overall: okay. They use daiya, but not very well. we posted a quick bite about hard times on the site last week, and after trying it out for myself, i am officially in love with their pizza. UPDATE 12/21: we have found that hard times pizza uses follow your heart as their vegan cheese. also, we tried it and it was AWESOME. 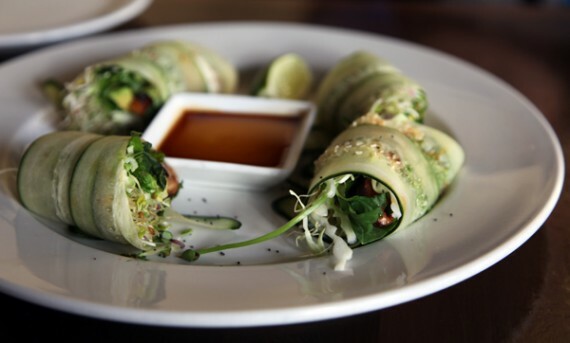 it’s time for another quick bite! this one comes to us from trishells, who recently hit up hard times in silverlake. 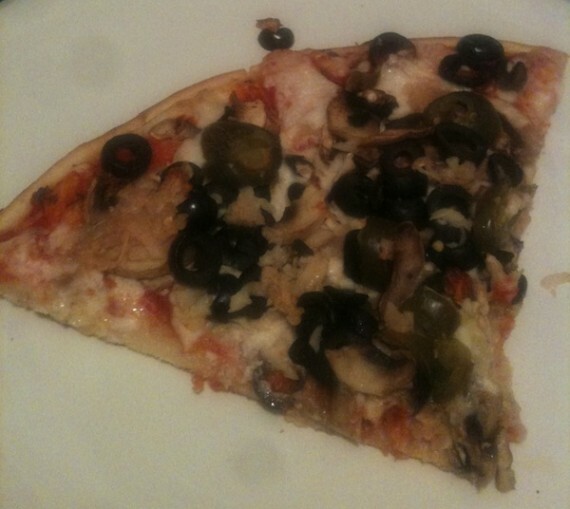 the pizzeria has recently started serving vegan pizza, and according to some tweeps, it’s available by the SLICE. whoa. 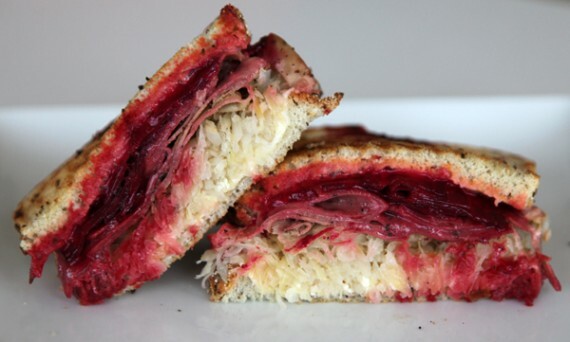 we aren’t sure what vegan cheese they are using, but people who have eaten it are saying it seems like the new teese. we are gonna try to get to the bottom of the cheese brand issue and report back. as we know, it’s a pretty important thing to find out. meanwhile, here’s trishells’ review! 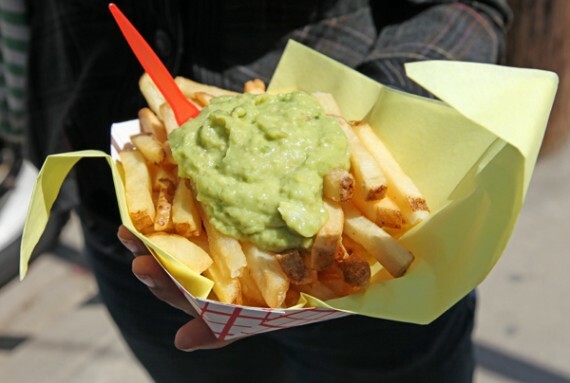 fresh fries: a vegetarian french fry truck in los angeles! dammit, i really do love the food truck craze! 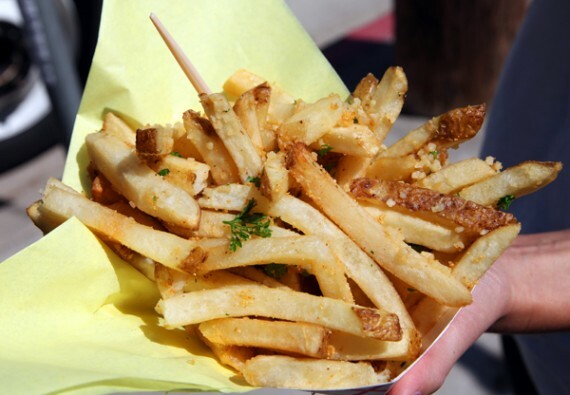 LA has so many vegan-friendly twittering trucks, and now i can add fresh fries to my list of favorites. the entirely meat-free operation, headed up by 2 vegetarian foodies who promise to use only the ingredients they would use at home, specializes in quality french fries (duh!) 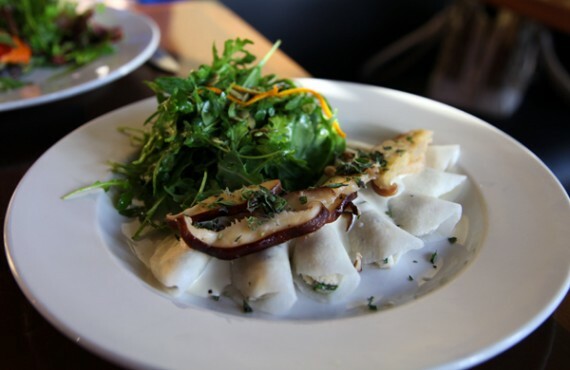 and has loads of delicious animal-free options. 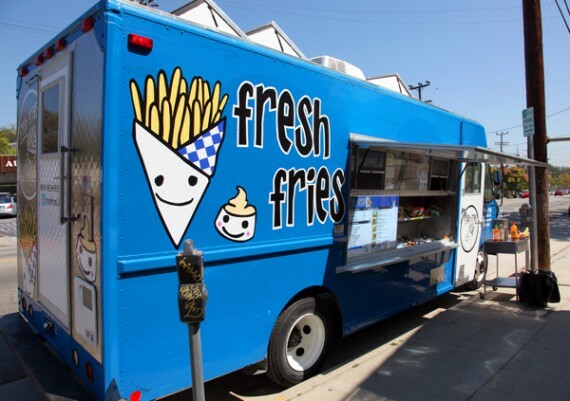 fresh fries has been rolling around the streets of los angeles for awhile, and i finally caught up with their truck yesterday near the PETA office in silverlake for some damn good greasy grub. let’s just say that i was beyond impressed. i mean, i’ve had a lot of good french fries in my life, but these were special. very special. 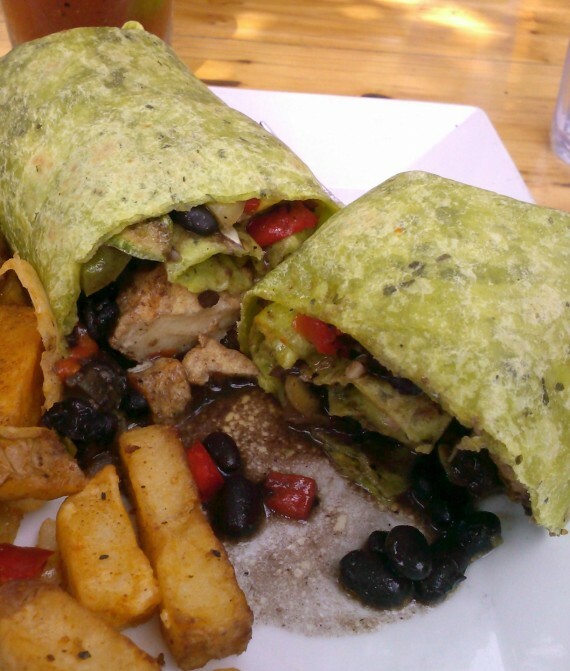 Our vegan options include: Natural Cut & Sweet Potato fries. 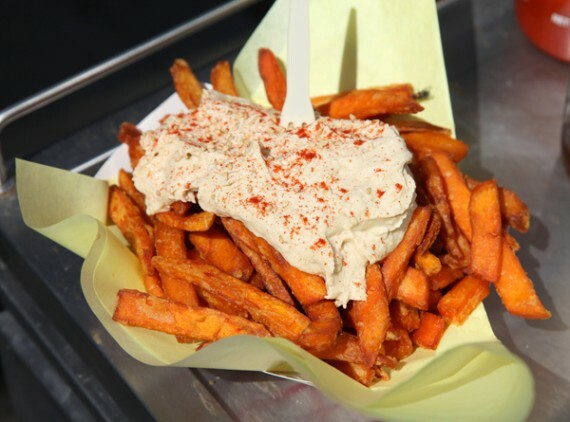 Fancy Fries include: Vampire Repellent aka Garlic Fries, Sweet Potato Hummus Fries, (we plan on adding more!) and most of our ketchups: wasabi ketchup, chipotle ketchup, bbq, curry ketchup, etc. now that that’s settled…i ordered the newest item on the menu, hummus fancy fries: sweet potato fries topped with hummus, smoked paprika and sesame seeds. this dish was actually inspired by the folks at one of my favorite blogs, drink eat travel, which made it even more delicious. the fries themselves and toppings at fresh fries are seriously top notch. i didn’t think i’d be so smitten after just one visit to the truck, but i am. the long potato strips are the just the right width—not too thin and crispy, but also not all fat and mushy. i’m talking perfectly sized and slightly crunchy wedges. the toppings were also completely amazing. from the sauces (we tried wasabi and curry ketchup) to the hummus, it was all homemade and hand-spiced, not out of a bottle. 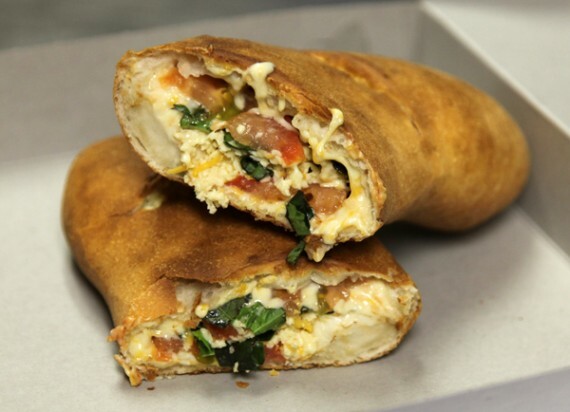 everything on the truck is made fresh daily, and it’s obvious in the taste. my only guff with fresh fries is that their menu is pretty dairy and egg heavy, and it’s all stuff that could be easily veganized. i mean, come on! is anyone gonna notice if you make the chipotle mayo with vegenaise instead of the real stuff? couldn’t you carry daiya or teese for a vegan version of the cheese fries? this is a pretty small complaint, considering how much i loved the fries…but i think it’s worth it to ask. right?! it worked with frysmith, so maybe we’ll get lucky a second time. either way…run, don’t walk to fresh fries! they have wonderful fries with inventive toppings that you can’t find anywhere else. and how cool is it that they don’t serve flesh? i love them with all my <3. new flore brunch menu: VEGAN BISCUITS AND GRAVY! just one more reason to love weekends in los angeles: there’s a new brunch menu at flore, and it is fantastic. seriously, you gotta get over there saturday or sunday and check it out. we are talking new scrambles, waffles, and last but not least…BISCUITS AND GRAVY. we went last weekend for the menu’s debut, and while i knew it would be pretty good, the food exceeded all of my expectations. i ordered the biscuits and gravy (natch), and they were nothing short of epic. for under 10 bucks, i got two massive biscuits covered in white creamy gravy and topped with flore’s homemade sausage. plus, a bed of kale with tempeh bacon on top. SO MUCH FOOD. 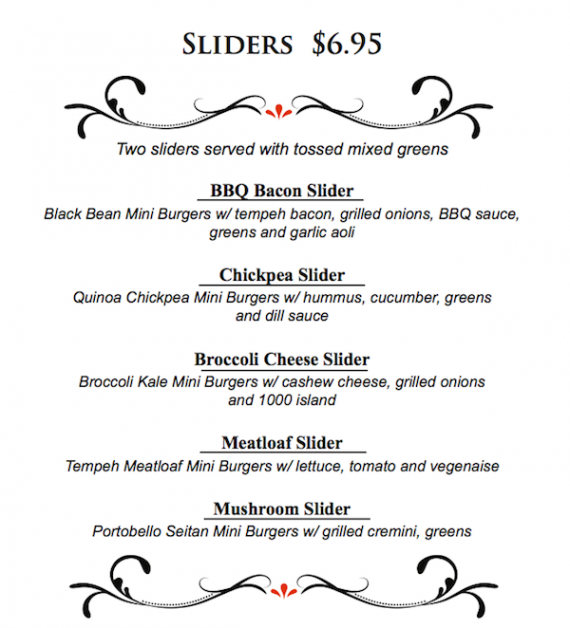 the menu description doesn’t even begin to do these guys justice…it doesn’t even list the fact that they come covered in seitan sausage. i was in no way prepared for how delicious they would be. honestly, everything about them was top notch—the biscuits themselves were soft and fluffy, the gravy was rich and flavorful, the sausage bits were plump and hearty, and the kale was fresh. this meal was so good, i had to take its photo from both sides, just so you could get an idea of how glorious it was. honestly, i think i am gonna go order this again tomorrow. 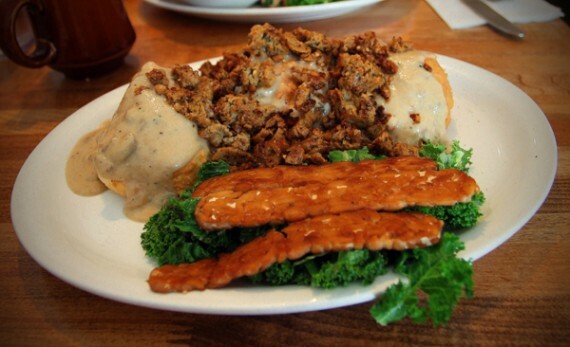 where else can you get vegan biscuits and gravy in los angeles?! nowhere that i can think of! and the ones at flore will BLOW. YOUR. MIND. i am so grateful they added these things to the menu. my husband went with the traditional tofu scramble, which was also flawless. 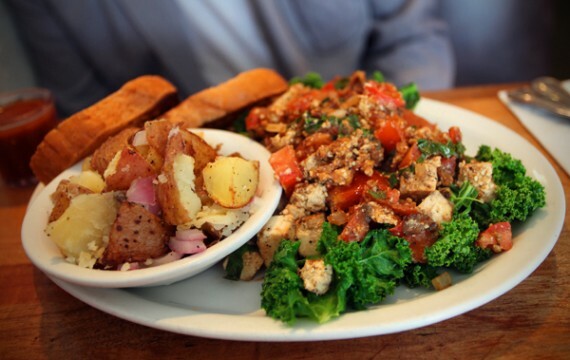 it came with huge chunks of extra firm tofu, all mixed in with extremely fresh vegetables atop a bed of kale, served with sliced bread and potatoes. breakfast perfection. flore’s brunch menu is only served on weekends from 10am – 1pm, so don’t strut in there expecting biscuits and gravy any ole time of day. also just to clarify, these items are only available at flore in sunset junction, not to be confused with its sister restaurant the meet market down the street. 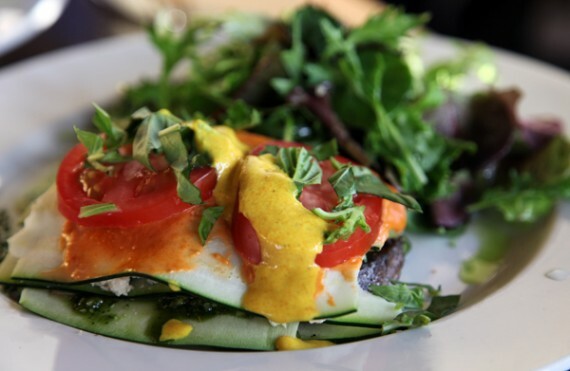 if you don’t already have plans this weekend, i highly suggest you work brunch at flore into your schedule. the food is second to none, and the biscuits and gravy are my new favorite meal. 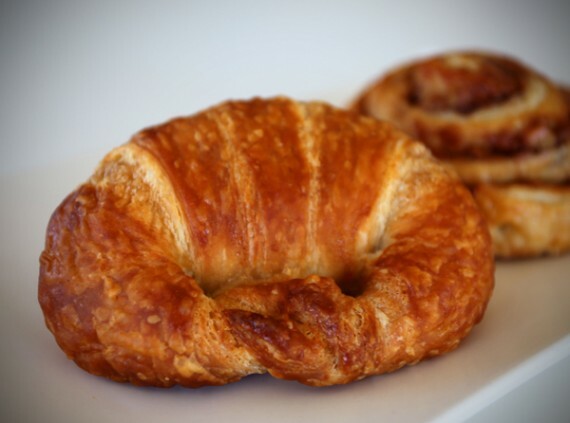 oh, and while you are there, be sure to pick up a few croissants! 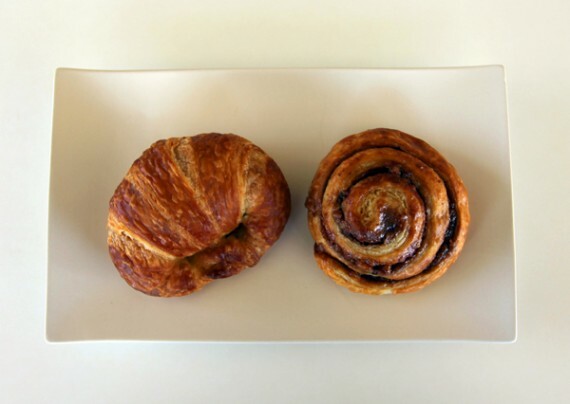 vegan croissants and cinnamon buns now at flore! 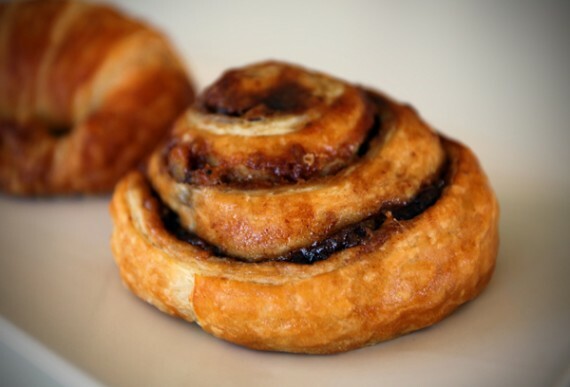 you have got to get over to flore ASAP, because yesterday the restaurant started carrying homemade vegan croissants and cinnamon buns! i tried both of them, and they are out of this world. i don’t know how i’ve lived so long with out them! first, the croissant. this thing is really a work of art. the only flavor flore carries at the moment is chocolate chip, and it is incredible. soft, delicate layers of flaky buttery goodness–all encasing a center of creamy chocolate. i was a big croissant fan before going vegan, and i can say these definitely pass the test. they without a doubt taste like the real thing. i don’t know of anywhere else you can get vegan croissants in los angeles, so go buy as many as you can at flore. the vegan cinnamon bun was also beyond delicious. it was moist, fluffy, and filled with the sweetest, tastiest cinnamon goo. i may have to make another trip to silverlake today for these treats….they are definitely some of the best vegan sweets in town. flore opens at 11am today. you know what to do. update from cru on their honey policy! FREE FOOD, DUDE! cowboys and turbans! want FREE FOOD from cowboys and turbans this weekend?